"Viperfish" is the common name used for all the species of the Chauliodus genus. These fish are best known for their ferocious appearance. Currently, there are 9 known species. The genus has a world wide distribution, occurring in oceans with tropical and temperate waters, at depths ranging from 76 to 1500 m (~ 250 to 5,000 ft). During the day, they stay deeper in the ocean emerging during the night to forage. All Viperfish have an organ called "photophore". This photophore emits a natural light and is located near the dorsal spine. When hunting, this organ flashes every now and then, luring all kinds of prey. When using the organ, they stay motionless (usually for hours), only moving their spine. Once prey is close enough, they will use their fanged teeth to immobilize and kill it. The photophore is also used as a means of communication with individuals of the same species (rivals or possible mates). Many species live in extremely deep waters and have adapted to survive for many days with little or no food. It is believed that certain species can swim at a speed of twice their body length/per second, however this is not endorsed by the entire scientific community. 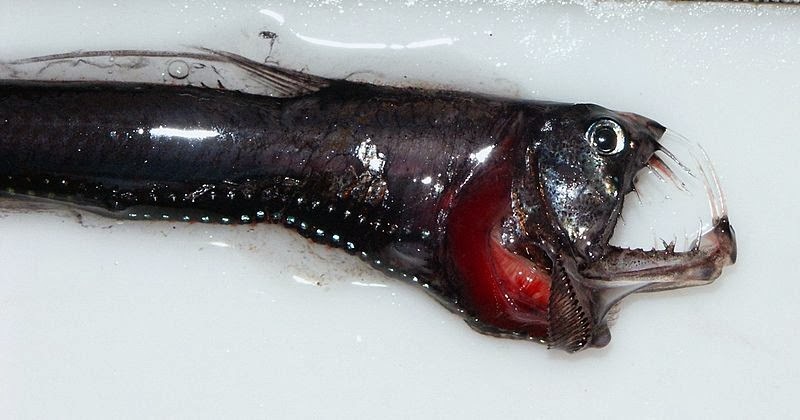 In the wild, viperfish can live to 30 to 40 years old. However, captive specimens die in a matter of a few days. Their diet primarily consists of small fish, shrimps and many other small crustaceans. The viperfish's main predators are dolphins and sharks. Little is known about their reproductive patterns. The eggs are probably spawned externally and then fertilized by males. - The Sloani's viperfish species (Chauliodus sloani) holds the Guinness world record (fish category) for largest teeth relative to head size. Sloani's teeth are so large that the fish has to open its mouth in a vertical position before swallowing prey.